This morning I woke up to a flurry of emails and phone calls about American’s new award chart changes. What was presented to me by AA was that AAnytime awards would be changing (basically going up) and some low tier elite levels would go from getting two free checked bags to one. With some other minor changes, overall the news wasn’t great, but it was far from the bloodbath that we’ve seen in other devaluations. Well, sadly American left a lot of information out of their press release and most of it is bad for consumers. I spoke with Suzanne Rubin, President of AAdvantage this morning and was able to get some clarity on what is actually going on and I relayed my dissatisfaction with the poor communication and big program changes without any advance notice or detail. I understand that they don’t want to overload a press release with minute changes, but omitting the discontinuation of a certain award type that one of your loyal members may have been trying to save up for, is bad business in my opinion. I find it disingenuous for AAdvantage to send an email with bolded headlines of “Redeem for Less / No Blackout Dates! and Checked Baggage Policy”, without mentioning any of the other negative changes. In fact, I’ve had to dig to find information on a lot of these changes, so I feel like they’re trying to withhold information. In any case, here are the key changes that happened today and if I missed any, please comment and I’ll add. Bottom line: the merger promised shareholders huge savings and you’ll see in most of these changes fees are going up and mileage needed for awards as well. 1) Starting immediately you can no longer build in stopovers over 24 hours on international awards at the gateway city, which I had just written about in detail yesterday (and many times before). This was one of my favorite features of the program and it really allowed you to maximize your awards- especially if you lived in a gateway city. Q: Can I continue to book oneworld explorer awards? A: oneworld Explorer Awards are no longer available for award booking. We will continue to honor any award tickets issued on / before April 7, 2014. Please visit our oneworld and Other Airline Award Chart for more information on flight awards for oneworld and other participating airlines. 3) American Gold and US Airways Platinum and Gold elite members who currently receive two free checked bags, will only get one free. For flights operated by American, these changes take place for tickets issued starting today. For flights operated by US Airways, these changes take place for tickets issued starting April 23. If you have a Citi or Barclays card with free checked bags and are one of these lower tier elites, you can use that benefit to count for a second bag. 5) US Airways will begin offering first class meals on flights 1,000 miles (~2.75 hours) or longer, which is a solid improvement from their current policy of only meals on flight 3.5 hours or longer. 6) The unaccompanied minor fee is increasing from $100 to $150 one way (plus tax). 8) On flights to/from Brazil the second bag fee is being removed. 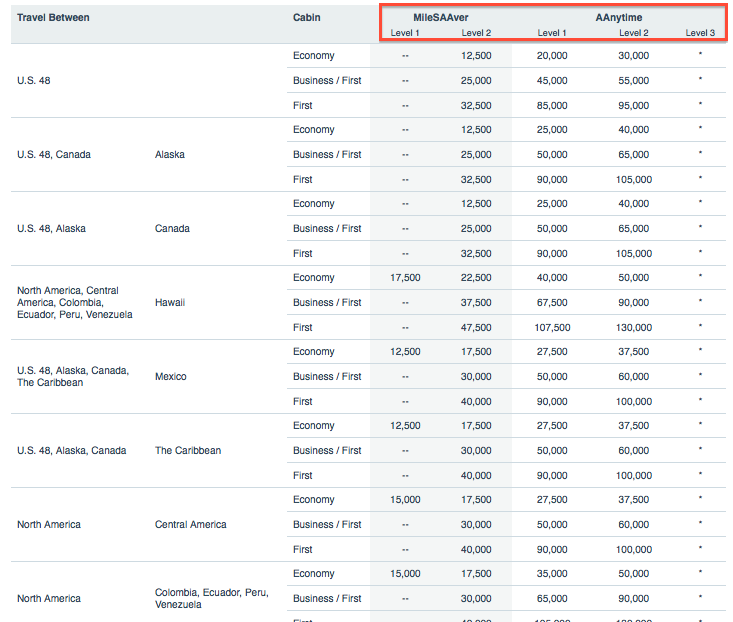 10) US Airways increased the amount of miles for a business class saver award from the US to North Asia from 90,000 to 110,000. I’m still going to maximize the 100% Share Miles promotion because even at 110,000 miles, I think paying ~$1,300 for a roundtrip business class ticket to North Asia via Europe is a phenomenal deal. This is only the beginning of many more changes to come and I’m curious to see how they integrate the loyalty programs. Whatever they do, I hope they communicate in a much more clear and transparent way. I also think it would be beneficial to give more time to digest huge policy changes instead of implementing them overnight and springing them on their most loyal customers.